The show could have ended when that crescendo of kisses happened. And I don’t simply mean the episode could have wrapped up: I mean Bob’s Burgers could have called that the series finale, and I would have understood. Been sad about it, sure, but I would have understood. That sequence pays off Tina and Jimmy Jr.’s now basically official romance with one hell of a Valentine’s Day kiss, gives Bob and Linda a sweet moment after the deeply silly hip-hop dance gift, lets a few of the town’s other assorted weirdos get in some of their own canoodling… oh, and that’s right, just goes ahead and makes Louise and Regular-Sized Rudy a real, honest-to-goodness thing, something I’ve been calling for since I started reviewing the show. (One of many receipts I could share, from Thanksgiving 2014: “Louise and Regular-Sized Rudy are destined to end up together.”) Given such past pronouncements, perhaps I’m abnormally likely to love the end of this episode. But “Bob Actually” isn’t just mere holiday wish fulfillment—or, in the case of Tina, nightmarish wish deprivation. In all cases, the episode does the work to earn all its concurrent endings, including Tina’s final dash back to the bathroom. Her relationship with Jimmy Jr. has undergone legitimate change this season, in the latest example of how Bob’s Burgers is willing to gradually tweak its status quo. Not that things are that different, as Jimmy Jr. still shows at best begrudging interest in Tina as he invites her to a Valentine’s lunchtime surprise. But Jimmy Jr. is a natural showman and lover of big stupid spectacle—it’s one trait he does share with his dad, come to think of it—so the prospect of bouncing on a trampoline for a sky kiss is enough to get him legitimately excited. It’s a bizarre dynamic, yet a logical one: Jimmy Jr. doesn’t care about Tina the person, but he cares about her as the other half of his ridiculous, hare-brained stunts. So he looks legitimately excited and happy when Tina shows up in those stilts to go through with the sky kiss after all, instead of being embarrassed by her mad persistence like he might have been a season or two ago. From a character standpoint, these two teen idiots relate in much the same ways they always have, but leaving the door more decisively open for this kind of grand romantic silliness lets the episode feel that much fresher and funnier. Then there’s Bob and Teddy’s visit to the hip-hop dance class. There’s a lot of ways this subplot could go wrong. Bob’s Burgers has a strong enough track record that it can present a white suburban mom and her adult son acting “hip-hop” and have it come across as its own self-contained bit of dorkiness, rather than anything too rife with uncomfortable implications. Even so, it’s probably for the best that Bob just spends his entire time there convinced that this is all a phenomenally bad, cringe-worthy idea. That he ultimately finds a dance worthy of Linda’s Valentine’s gift—complete with one hell of an opening pose!—helps seal the overall sweetness of a story our hero clearly can’t believe he’s actually living through. The aftermath of the failed hip-hop battle captures how intentionally low-stakes this particular plotline is, though this typifies the show’s unique charm: Even when pathetic characters have their most pathetic possible moments, everyone involved is shockingly nice about it. It wouldn’t be a big, multi-story Bob’s Burgers episodes without at least one proudly dumb storyline, and the perpetually annoyed Bob is a reliable person to have hold down that storytelling spot. I say that, but maybe I shouldn’t discount the glorious silliness of Linda’s and Gene’s stories. With the former, the subplot works as a sort of condensed version of previous Linda’s Valentine plotlines, with her attempting to help someone rediscover the Valentine’s spirit when it’s clear they are in no fit state to do so. The least memorable of the episode’s stories, this is mostly worthwhile for its terrific punchline, as the jilted ex-wife claims her new steady boyfriend is “Him… Jim… Jim Himjim.” And, to the extent that any of these little stories in “Bob Actually” are meant to recall similar stories in its namesake Love Actually—and I’m really not convinced any are—Gene’s time spent with an Italian substitute lunch lady feels at least vaguely inspired by the movie’s Colin Firth plotline. But then, Gene’s burgeoning love affair isn’t with the cafeteria worker, even if he is resentful of the boyfriend she is cooking for, but rather with the once-hated dark chocolate. Both these stories are solid, which given their short running times, is really all either needs to be. 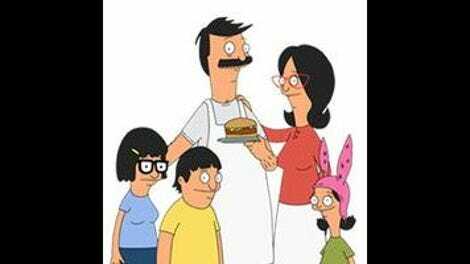 And when all five Belchers get their own stories, best to give the least important ones to Linda and Gene, both of whom can be great characters who carry great stories but don’t demand superlative material like the other three family members do. Which brings us at last to Rudy and Louise. The show has teased something between these two—at least in the sense that Louise had never purposefully tried to kill or otherwise harm Rudy, which counts as a serious soft spot by her standards—since their museum-exploring, train-robbing early days. Yet for all my jokes about it, the show has never actually suggested a romance before, which makes it all the more impressive how quickly they commit to the idea once it’s out there. The episode cleverly subverts Louise’s—and at least some of the audience’s—expectations by having Rudy actually carry a torch for someone else, which lets Louise move from weird, bad feelings like attraction and love and into much clearer, easier emotions like jealousy and rage. She’s good at those! What’s so brilliant about the episode’s handling of Louise is that she is always totally honest. She tells Rudy exactly what’s going on about Chloe, she tries to force Chloe to do right by Rudy, in part by offering an obviously earnest appraisal of what makes the guy special, and she offers a doubtless sincere promise to end Rudy if he ever lets anyone know about that kiss. 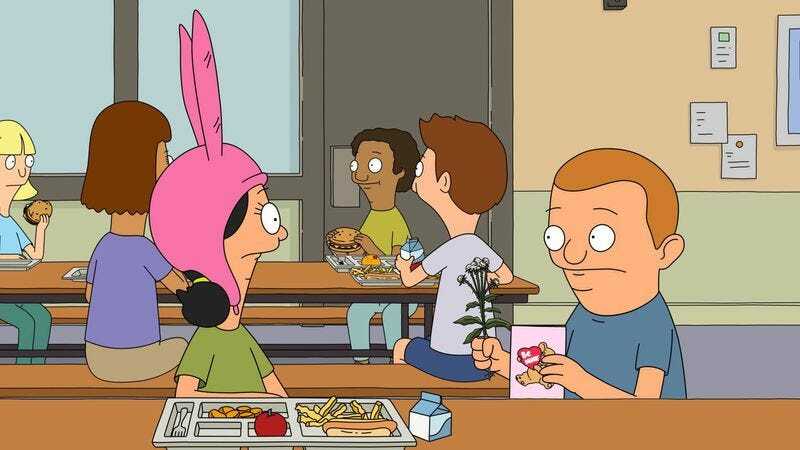 Bob’s Burgers found a way to take Louise and maneuver her into a heartfelt, emotionally satisfying kiss at an episode’s climax. This isn’t as simple as her Boo Boo kiss, which was based on a more straightforward, albeit unhinged lust. As much as Louise was once portrayed as—and can still be when the story demands it—a pure trickster plot device, a whirling dervish that can set all manner of chaos in motion with little regard for consequences, the show has more recently made it possible for real, messy emotions to break through and affect her. Bob’s Burgers has played a commendable long game in making Rudy the one character outside her family that Louise could feel such things for. “Bob Actually” brings that story to a crescendo, as it does with all the other little stories it had just started telling that week. The result is a perfectly joyous little slice of Valentine’s Day goodness. The way you know Louise sincerely cares about Rudy: She slapped the crap out of him after that kiss. It isn’t a real, romantic Louise kiss without the slap. I still can’t quite believe that Chloe Barbash was voiced by Stephanie Beatriz, better known as Brooklyn Nine-Nine’s Rosa Diaz. That may be the most unrecognizable guest voice-acting spot in the show’s history. Yeah, sorry this is going up so late—I’ve been on the road this week, so reviewing has been a bit tricky, and the new (and otherwise much better!) 9:30 airtime doesn’t help. Should definitely have these up earlier going forward.